Gentle Giant’s line of jumbo Kenner action figures takes the original vintage Star Wars figures and blows them up to 12″ figure scale (including the packaging). They’re not exact copies of the old figures (both in appearance and materials) but they’re pretty darn close. This is the first character from Jabba’s palace that they have released (assuming you don’t count Boba Fett, etc. ), which isn’t too surprising since up until now they’ve mostly been going in chronological order — the other figures they’ve released so far have all been from A New Hope. As you can see below, the difference in size is quite impressive, especially because the Gamorrean is easily the most portly of the vintage Kenner figures. His bubble sticks out more than 5 inches from the card! Unfortunately that makes the packaging rather fragile. Mine got a bit crushed in shipment. They originally said that the Gamorrean would be a Premier Guild exclusive, meaning that you would have to join their $70-a-year club to get one. And in fact I did just that, mostly because of this figure (although the discounts they offer to members can also be pretty good). 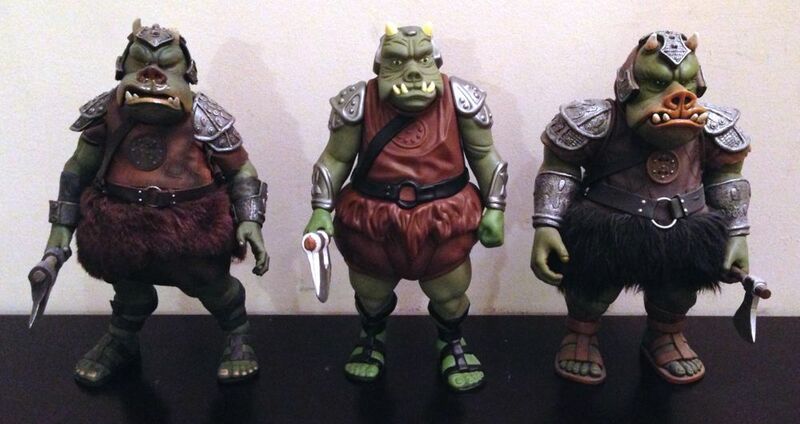 However, they later ended up saying that the regular Gamorrean (based on this figure) would be available to everyone, while the Premier Guild-exclusive figure would be based on the Power of the Force version. The differences are the card, which has a different design than the regular figure, and the coin that it comes with. The original POTF coins were aluminum, but I had feared that Gentle Giant might opt for something like chromed plastic instead. So I was quite impressed when I picked up the coin and felt its weight. I don’t know what metal it’s made of, but it is impressively heavy and attractive looking. Here is the figure with the Sideshow 1/6 scale Gamorrean Guard figure and my repainted 12″ Hasbro Gamorrean Guard figure. Seeing it at this scale makes you appreciate how good the original sculpt really was for this figure. I’m really hoping that they will release more Jabba’s palace figures, and of course I would kill for a 12″ version of the vintage Jabba figure. Are you listening, Gentle Giant?